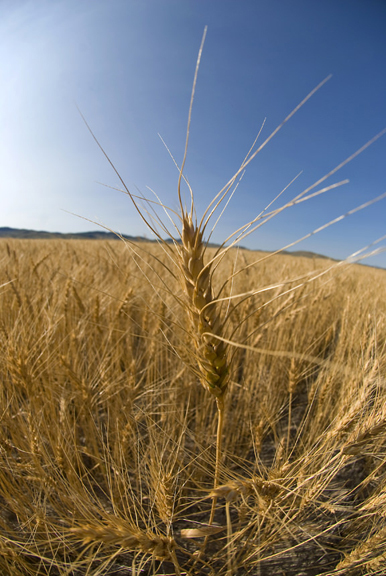 Are Wheat Montana products Non-GMO? Yes, please review our Non-GMO statement attached here for further details. Grains: If you store the grains in a plastic pail with an oxygen absorber in a temperature stable environment, the wheat should last six to eight years, perhaps longer. Flour: any other products that have been processed, such as the 7-grain flakes, various cracked grains, pearled barley, and groats should be used within a year. Nutritionally both the Hard Red Spring and Hard White Spring varieties that we grow are the same. Basically the difference is in the end product: Bread made with Hard Red Wheat is darker and denser (more of a brown traditional look). Items made with Hard White Wheat “look a little more like white bread”. They bake up a beautiful golden color and do not possess the stronger taste associated with the traditional whole wheat breads. Actually the first question we usually get is 'What is impact milling and why don't you stone grind your grains?' The answer is simply that impact milling, we think, produces a much superior flour than either commercial roller mills or stone milling operations. The mill itself is entirely mechanical and consists of small hammers rotating at high speed in an enclosed chamber These hammers strike the wheat in mid-air with such impact that the wheat is immediately shattered into flour. Impact milling does this at an average temperature of only 94 degrees F (34 C) . High heat destroys the vital nutrients of the grain and tends to produce rancidity. Hammer milling produces an excellent quality, nutritious whole wheat flour, at low temps! Recently there have been reports of the rampant use of Roundup or Glyphosate on wheat. These reports have spawned a plethora of questions about the farming practices used for grains grown on land controlled by Wheat Montana Farms. Click here to read more.